I love falling into a good book. I found this one when I was surfing the aisles at my local used-book store, and as I am a woman of a certain age, the cover art captured my heart. Oh, cassette tapes; how I love thee! 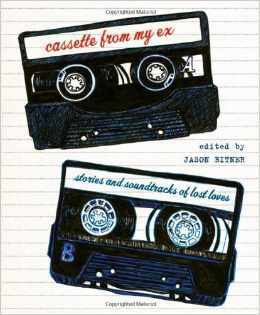 This book is basically a collection of short essays wrapped around the theme of mix tapes, where the various contributors share their stories of love and loss and the mix tapes that preceded them. In some cases, portended them. Pretty much what you expect from the title of the book, but like a good mix tape, it delivers much more when you really listen. The essays of heartache and breakup and longing and happenstance are not just stories, they’re memories from a magical, moody time of life when it was easier to speak our big emotions through someone else’s songs. The mix tapes here represent the lost art of the tape, and oh, that makes me sad. I took a trip through my own memories while reading this collection and pondered the sheer volume of mix tapes in my own past. I made tapes for myself. And while music has been a big part of every meaningful relationship I’ve had, I don’t recall a boy ever giving me a mix tape. The only one who did? I married. And he’s the only boy I recall ever making a mix tape for. Mixing a tape is an art form; the balance of mood and energy, old songs and new. When you make a tape for someone, you’re giving them a little bit of who you are, offering up a new view into your psyche. The best mix tapes combine something old and something new, something unexpected and something comfortably familiar. A good mix tape took hours to create, thought must be put into it because you make a mistake? You start the whole thing over again. Making a mix CD is not this thoughtful. You pick and choose songs, drop them in a playlist, revise if it’s too long, click “burn to disc” and go about your business while your CD is created. Mix tapes were hands-on. Pictures of the original artwork and tapes complement the essays, and a track list is included for each. Most of the tapes broke what I consider to be the cardinal rule of mix tapes (a rule echoed by contributor Joe Levy), in that you never, ever have a song by the same artist back-to-back, and if you must include more than one track by an artist, you must put them on opposite sides of the tape. In this book, my favorite tape is the one offered by Emily Rems called “A New Shipment of Crabs Mix” because it reminds me of a boy I knew in high school who wanted our song to be “We’re An American Band” by Grand Funk Railroad (we liked our old rock & roll) and because her tape reminds me most of a tape that I would listen to in my car.